1) How much of an idea of your character did you have before filming, either as preparation material sent by Remedy or your own personal ideas on the sort of character you wanted to portray? Well, prior to auditioning for the role (for the director / writers / producers) - I had zero ideas given to me by anyone about who the character was - so I did a lot of work on my own for the auditions, and filled in those holes myself. Once I'd been hired for the role, the Director (who was also one of the writers) and I had a lot of discussions and exchanged ideas with one another, all of which helped inform my choices. Remedy hadn't sent me anything directly, my communications were with the creative team behind the mini-series, and once I'd been hired - they gave me a copy of the script (which prior to that had been kept under tight wraps). That, combined with my discussions with the director, and the personal work I did myself - all informed what became the character of Jake in Bright Falls. I spent time doing things that would help me better understand Jake's confusion, frustration and fear - at not being able to understand what was happening to and around him. For example, one night I drove out to a deserted camping area off of PCH in Malibu, and walked into the woods barefoot and just sat out there for a while - in the dark - under dim moonlight. Obviously I didn't get eaten or anything - but those kinds of thoughts race through your head every time you hear a twig snap somewhere nearby - and you can't see anything. You start to "hear" and "see" things around you. Pretty creepy - but it ended up being very informative during shooting - because it gave me an experience to draw from. 2) What did you find most difficult about portraying Jake? Definitely portraying an individual that was seemingly descending into madness and had no understanding, memory, or awareness of what was happening to him at night - who additionally had to oscillate between one state and the other. Its one thing if you're going mad and its a seamless process - so you're unaware of the change and always in that state of mind. But Jake would wake up completely normal and aware, but missing entire blocks of time. He'd wake up in really weird places, covered in mud or soaked and in a bodybag. But when he came to - he was completely sane. That's messed up - to oscillate between being fully present and aware - and being unable to account for how you arrived where you were. That would'nt mess with an insane mind - I don't think - because you'd never know any different. But it would really mess with a sane mind. If you're sane when you come to - you'd be forced to process your reality, the reality that you just woke up soaked in a body bag near a lake. And unlike "the hulk" or "warewolf - Jake had nobody to tell him what was happeneing to him. That's not only scary from the point of the "unknown", its scary to be fully sane and aware, and know that you cannot predict what will happen in the coming hours, or that you might have killed someone last night, etc. You and I and everyone else understands that it was this mysterious "darkness" taking him over at night, but Jake - in Bright Falls - obviously does not know that. It's a bit of a conundrum as an actor, but a tremendous amount of fun at the same time. 3) Have you played Alan Wake since filming Bright Falls and, if so, has playing the game influenced your view of the miniseries? I played it quite a bit right after it came out - and thoroughly enjoyed it. Its a great game - well crafted and suspenseful. I'm not a huge gamer to be honest, but AW is the kind of game that I really do enjoy. I can't say that the game influenced my view of the miniseries really. Bright Falls was what it was - while we were making it - and it lives on as such in my mind. Playing the game - I could certainly see the influences of the game on the miniseries, but that's about it. Maybe the other way around though - Bright Falls definitely influenced my experience of playing the game - because I had very real, tangible experiences from filming - that were triggered by certain places and experiences during gameplay. 4) Do you have any favourite scenes or specific quotes from Bright Falls? Ones that you liked upon reading or which you particularly enjoyed recording? Hmm... well its been a while now, so things have faded a bit in terms of immediate recall... but there is one scene that lives on in vividly in my head. First of all - if I went and watched the series - I'd most definitely have a handful of scenes that I loved (or more). But the one that never escapes me - is the scene where the sheriff comes to my hotel room. That scene fired on all cylinders. The writing was great, and it was wonderfully acted by Robert Peters - who is, to this day, a good friend of mine. I don't know if others see it the same way - but I think it's hilarious. Several good lines here: "No squirrelly animal did this... These are the markings of what I'd say is a... fourteen point stag. Yeahp. See the pattern? Cut and buck. Horned rimmed entry points. You had a trophy deer here, you know that? Would've fetched old Sam a hell of a prize. Too bad he flew the coup. Probably on some bender. He's got a bad habit. Boys are gonna love this" That has to be my favorite set of lines in the entire series. Cut and Buck? I went home and looked that one up - there is no such thing!! Horn rimmed entry points? Who says that stuff? 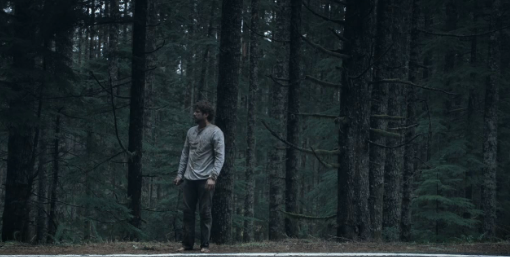 5) In the final scene, Jake accepts his fate and disappears from the car. If you were to write another episode, how would you continue it? Oh that's an easy one: Jake IS the darkness - he becomes the "head" of the darkness - and becomes Alan Wake's arch nemesis... Light vs Dark - like a modern day Star Wars, right? Maybe Jake and Alan find out that they're brothers, separated at birth. Ok that might be a little lame, but you get the point. And - let us not forget Ellen - I think it would become Ellen's obsession to save Jake and bring him back, because she somehow felt partially guilty for his predicament. We find out that the Dr is the man behind the curtain controlling it all - its one big scientific experiment - and we're all his pawns in a giant chess game. Try as they might - the forces of "good" and all of their resources cannot bring Jake down - but there is... one man - a lone cowboy - that can... and its none other than the sherriff! Ok - let's just stick with the first part - Jake and Alan become arch nemesis'. 6) The web series had several interesting locations, which was your favourite to film in and why? By far the ski lodge (where he met with the Dr.). That place was magnificent, as were the 7 foot snow drifts outside the windows. It was almost haunting... although that might have a lot to do with my love for "The Shining" - scenes from which were filmed there. That is the location I remember the most vividly. A lot of my scenes were outdoors, at night, or in the rain - so those locations kind of blur together, but the lodge stands out. 7) The protagonist’s clothes are used to express the passing of time during his adventure, how do you think Jake’s costume contributed to feel of the series – and how glad were you to change out if them by the end of filming? Its a funny thing - I don't have a vivid memory of the clothing. And I find that odd, because as an actor, I can tell you that wardrobe goes a long way to inform the character. And, I might add, the wardrobe department on this shoot was nothing short of magnificent. It is often times, an under-appreciated part of a production - yet so vital. There are certain articles of clothing that Jake wore, that the production gave me to keep afterwards - that I still have today. Every time I come across them in my closet, it brings back memories. But as for the specifics of the clothes Jake wore, and the transitional element of the wardrobe - I don't have much recollection of it all. It served its purpose apparently - as it obviously informed your experience viewing it, and I know that it helped inform choices I made as an actor at the time, but its one of those things that stayed with the character, rather than with me. I am eternally grateful for one article of clothing... it was freezing cold on many of those days - and especially the nights - many of which were outdoor scenes. I hadn't thought to bring long-underwear with me, and those gals went and bought me two pair. That was a lifesaver, to be sure. Those two pair - are two articles of clothing they let me keep (imagine that) - and I still get great use of them when I'm working or visiting a cold climate location. Oh, and to answer the part about "how glad I was to change out of..." - there was one "costume" I was glad to get out of. 8) Did the final product meet your expectations you had when you first read the script? It did - I'd say it exceeded my expectation. And that's not because they had unlimited amounts of money to spend - quite the opposite - it was a tightly budgeted production. I've seen films with 10 times the budget that were 1/10th as good. It's a great testament to the level of talent behind this production - talent that was ubiquitious really throughout the cast and crew. This was a situation where 1 + 1 = 5. 9) It would be great to see Jake in an upcoming Remedy title. If offered, would you be interested in reprising this character in a game? I'd certainly consider it. I had a lot of fun. For me - its always about the story, and the people behind the production. If the story was as intriquing as it was for Bright Falls, and the people were as talented and as much fun to work with as they were on Bright Falls - and my schedule allowed for it - I'd be hard pressed to say no. 10) What projects are you doing currently or have lined up? Aside from my normal work in a few TV shows, the large majority of my efforts over the past two years have been entirely poured into a passion project of mine - a screenplay I've been writing (which is now finished) - titled "Lark Bunting's Least Likely", which is now in the process of getting made, and will be my directorial debut. Its a really remarkable story partially based on true events and real people. It's a gritty, real, raw, quirky dark dramedy - a drama infused with dark humor. I've been working on it for a few years - but really intensely for the past two, and it will consume the coming year as well. I'm currently doing a final rewrite now. We have an amazing producer attached, who will co-direct with me so that I can also play one of the lead characters. We're in the late stages of development now - preliminary casting and location scouting work kicks off next month, and we will be shooting later this year. Making a film is a monumental task, the biggest I've ever undertaken, and I've never worked so hard in my life - but its entirely worth it. Thank you so much for the interview Christopher!